I am happy to have had the opportunity to attend #OER17 last week in London. This Open Education Resources Conference with the theme The Politics of Open was the first time I have attended a conference which had as its focus of open practitioners, activists, educators and policy makers coming together as a community to discuss what this means for our society here and now. Open educational resources (OER) are freely accessible, openly licensed documents and media that are useful for teaching, learning, and assessing as well as for research purposes. It is the leading trend in distance education/open and distance learning domain as a consequence of the openness movement. While I have not actively seen myself as part of an openness movement per se (I tend to think things of value have a cost, otherwise it is difficult to think of them as valuable), I likewise believe that education, teaching, and learning involve a sharing of ideas, knowledge, and experiences to help people move forward in thinking and acting, along with the opportunities and responsibilities that come through them. My efforts in this area would not be possible without work that acknowledges and values a certain openness, and while my career in learning, knowledge management, and strategy within the nonprofit sector is based upon collaboratively helping to empower and support people to make the world a better place, so perhaps my work is not as far outside an OER-emphasis than I may initially envision. Given all this, I wanted to debrief my take-aways from the #OER17 conference before too long, and while this is not a fully inclusive list of everything that happened, it does include my own personal list of memories and next steps. I attend my fair share of conferences, and while I am frequently self-funded, I tend to go to all the sessions I can as the learning is my own investment in my professional development. I do attend all the plenaries, though the four that occurred at this conference–Maha Bali’s Hiding in the Open, Diana Arce’s Reaching other audiences: Art for social change, Lucy Crompton-Reid’s Opening up Wikimedia content and communities, and Muireann O’Keeffe, Catherine Cronin, and Laura Czerniewicz’s Plenary Panel: Mapping the Politics of Open were all excellent. Yes, EXCELLENT! Maha challenged us to consider how voices are or are not silent/silenced within broader interactions, Diana explored art as political action, Lucy challenged us to consider Wikipedia as much more than an open free-for-all, and Muireann, Catherine, and Laura explored ways that we all as a community made/make sense of our 2+ days together and how they challenged us to make concrete plans to do something with all this we learned and experienced. While my Twitter stream may not show me being very active during their talks, it was mainly due to the fact that I was live-Tweeting via the conference account during that period. Let’s just say that in thinking about how we engage with learners and learning in an open way, my approach is broader, while I am considering additional ways that this can be realized outside academia. BTW, the links above go to the plenary pages where the recordings of each may be found. While I found much of the conference focused around academic discourse (due in part to many of the open education researchers at the conference), there were other voices who initially appeared swallowed up in these discussions who nonetheless demonstrated that OER is really far beyond academia alone. To be fair, I teach research to graduate students in management and systems + human resource management and development, and while research has come to dominate my worldview (i.e., do you have evidence to support that claim?! ), my full-time work is as a Director of Training and Knowledge Management in an environmental nonprofit where we create parks and protect land for people. We do not theoretically do this, nor work through witty or thoughtful activities about this, rather we are hands-on in our application of our beliefs, and as such theory helps guide and articulate our work. We have real products when we are finished that make a real difference in people’s lives, not just nice thoughts about them. I do not want to appear critical of #HigherEducation, yet without bridging activities or learning with what we can concretely do with them in the world where our students live, is somehow missing something in the practice of higher education itself. In this way, I was very interested in discussions at OER17 that involved not just encouraging ways that students can think about or experience open resources, but when they take those notions and DO SOMETHING WITH THEM in ways that are practical, applicable, and actually make a difference to community and society. Granted, this often starts through the empowerment that happens when ideas are challenged and we think differently, though in many ways it is wasted effort if it does not effect hands-on change in some way. This was for me an issue I grappled with in the conference, and am continuing to make sense of how we can take these ideas and implement them (which, after all, is what education is all about). Let’s face it, in a world where the US President and his administration coined the notion of #AlternativeFacts, and the home of the OER17 conference venue itself just formally started the process to seek strength through isolation and #Brexit, widespread voices for the benefits of inclusion and openness are on shaky ground at best. In fact, while common sense may suggest that uniting and combining may be beneficial and add value (isn’t that what corporate mergers and acquisitions promises?? ), many will attest that sense is far from common in a world turned (in many ways) upside down. In fact, value does not occur through open education on its own, and all the free / available resources in the world will not move education forward. After all, when was the last time you went to your local public library and came out with ideas and resources to change the world? Alas, if we do not transparently and strategically communicate the benefits of openness through demonstrating them, then all the talk in the world that 185 well-intentioned on-site participants who met together in-person for a couple days of sharing and community will not advance us. I think this means that Theory needs to Inspire and Guide Practice, though Practice often leads and orients Theory, so without this almost iterative and collaborative approach by those who perceive the overall benefits of open education, all the good ideas in the world will simply gather dust once the final #OER17 Tweet is Tweeted and we move on with our status quo. Where does this leave us? More to the point, where does this leave me? 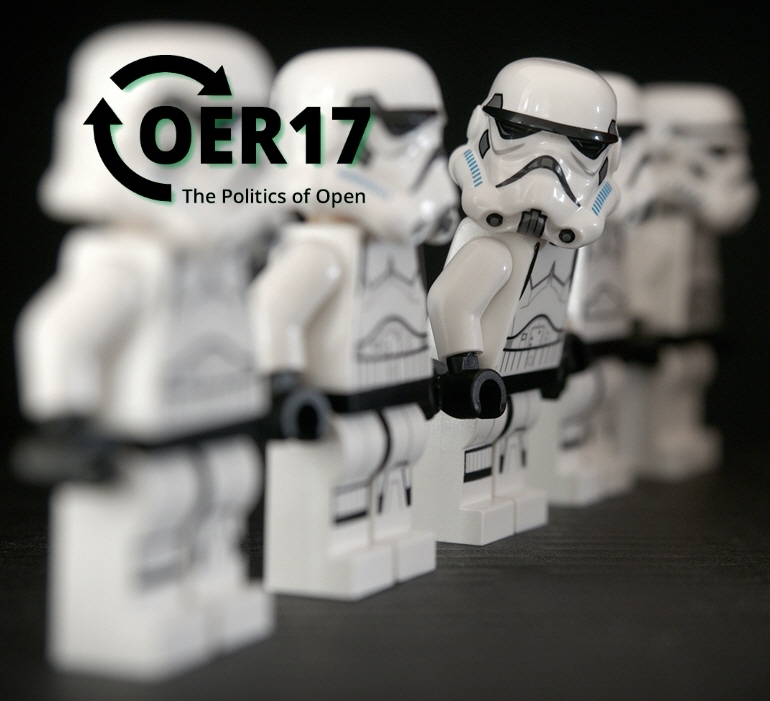 Now that I have been able to process some of the experience that was (and continues to be) #OER17, I am inspired to bridge more areas of Research<>Practice through Open Educational Resources. I believe I need to reframe the role these play in my thinking, teaching, research, and professional work, along with not only considering how to expand these, but doing so in ways that are natural and transparent across the diverse realms of interests I have. All this hinges upon professional and personal communities, as open resources without people to use and value them will not really be of much benefit. After all, open educational resources should bring a value that would otherwise not be gained if we do not engage with people. Previous Previous post: Goal Statement for 2017: Engage with Balance! Next Next post: You are invited to Wikipedia Day 2018!